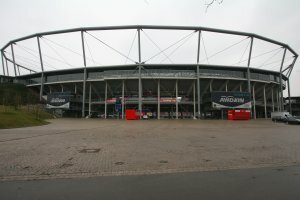 Hannover hosts four 1st round games and a second round match in the AWD Arena - the home of Hannover 96. Hannover Accommodation, Hannover Stadium, Hannover Tourism. Hannover's AWD Arena was formerly known as the Niedersachsenstadion (Lower Saxony Arena). Out of a 50,000 capacity (for domestic games), the AWD arena has some 43,000 seats. Leave the A2 (from Berlin or Dortmund) at the 'Hannover-Herrenhausen' exit. Heading towards the city you'll see signs for the ground. If you're coming into Hannover on the A7 (from Hamburg or the south) then take the 'Hannover-Anderten' exit. The B65 goes towards Hannover and you'll see the signs. If you're travelling on foot, it's easy enough to walk to the stadium. From Hannover main station, follow Bahnhofstrasse to Karmarschstrasse, then left into Culemannstrasse and right to the stadium, at Arthur Menge Ufer. Buses 131 (clockwise) and 132 (anticlockwise) both go to the Stadion. Alternatively, you can catch the S3, S7 or S9 to Waterlooplatz and walk the rest of the way. Most World Cup venues can be reached from Hannover within a few hours by train, apart from Munich, Stuttgart and Kaiserslautern. Kaiserslautern: 3hrs 50mins (via Mannheim). Be sure of getting a room in Hannover during the World Cup Finals by booking online before you go. Hannover, the capital of Niedersachsen (Lower Saxony), was once a medieval village on the banks of the River Leine. A market is said to have been held here as early as AD 950. View beautiful panorama images of Hannover. Type in a street name of choose from one of the recommended Hannover sights. Many of Hannover's major sights can easily be seen on foot. If you want to get a taste of them online, you'll need to allow pop-ups when you visit this site. The Herrenhausen Gardens are a little way out of the centre but a visit is possible with public transport - trams 4 and 5 take about 10 minutes to Herrenh�user G�rten from Kr�pke. The Hanover region offers interesting trips for sightseeing and little adventures. At the seaside, in the hills or in lively, charming towns - you'll find a large variety of activities to keep you busy in the Hannover region. The restaurant scene in Hannover is a colourful one, with 1,500 establishments to choose from. In summer, the beer gardens and street caf�s draw the crowds while in winter its the cosy pubs and bars around the station and Raschplatz that warm the soul.